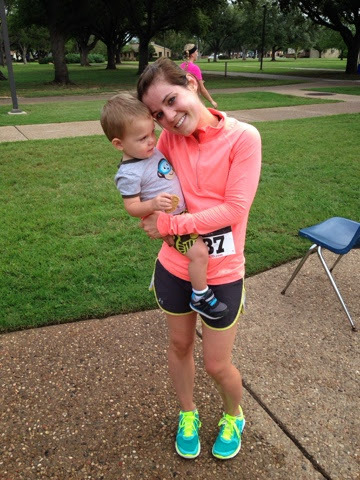 This weekend I ran a 5k and I LOVED it. I don't run many races because 1. I'm not that competitive, 2. They make me anxious, 3. I'm poor, and 4. I don't train specifically for them, I just shoot for a comfortable paced distance every day. But this one was free, and it's been a while, so I couldn't say no! I may not be competitive with others, I am competitive with myself, and I wanted to prove that my 6 miles a day are worth it and my hard work has paid off. I went into the race hoping to run it in under 25 minutes, and was really surprised when I finished in 20:55! I know this isn't fast compared to tons of people, but for me, it was awesome. Is it crazy that running makes me a little emotional sometimes? I started tearing up a few times during the race. I know. Mostly I was thinking about how hard I've worked to get to this point, and how thankful I am to have my health and strength back after too long of being in the pit of an eating disorder. I always ran then too, but now I feel strong and able and honest. I've worked hard for every muscle, every bead of sweat, and every heartbeat. My lungs were on fire, but in a good way. I was breathing deep and felt good the whole time. Running can get a little surreal at times when I'm in the zone, and I think that's what keeps me lacing up day after day, year after year. I love running, it's a huge part of my life, and it's (finally) for the right reasons. Also is there anything quite like seeing your 2 main men waiting for you as you cross the finish line? Oh, my heart. You do know this means I'll be looking to beat my record at the Turkey Trot now, right? I've officially rekindled my racing bug (read: occasional racing bug. It felt so good but also so bad if you know what I'm saying! My legs!). What are your must-haves on your running playlist? You seriously are AHmazing! Congrats on killing your race! And thanks for sharing your playlist! I'm always needing new music to run to !! That's a speedy time!! Congrats! (I ran a turkey trot a couple of years ago and WOW is it hard to run when it's freezing! My lungs burned! But it was so fun.